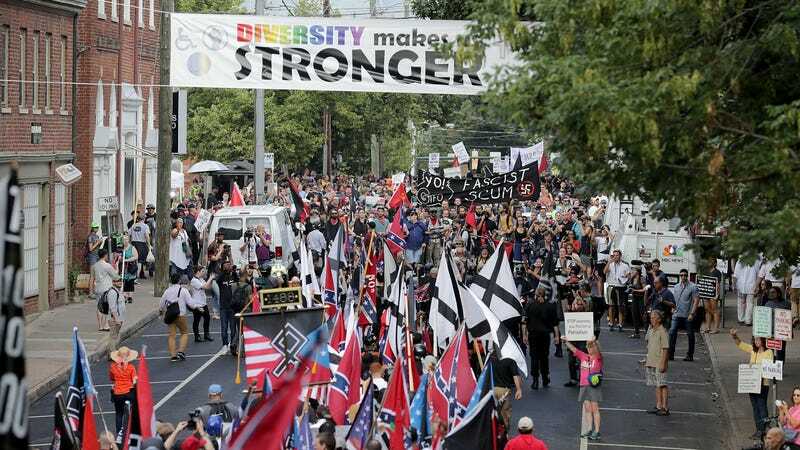 White supremacists, neo-Nazis, and other racist activists headed towards counter-protesters in Charlottesville, Virginia on August 12th, 2017. “This was a legitimate Facebook event that was being organized by Washington, D.C. locals,” says Dylan Petrohilos [of Resist This], a former Inauguration rioting case defendant that was involved in organizing the counterprotest. The coalition behind the event, Petrohilos says, is Shut It Down DC, which sprouted up after Jason Kessler, noted white supremacist and organizer of last year’s Unite The Right Rally in Charlottesville, announced this year’s D.C. iteration. It involves dozens of local groups, including the D.C. Antifascist Collective, Black Lives Matter D.C., Hoods4Justice, and Smash Racism D.C. According to a Facebook news release, the original creator of the “No Unite the Right 2 — DC” page was created in part with an inauthentic “Resisters” account. Though Facebook did not explicitly say the pages were created by Russia’s Internet Research Agency (IRA), which U.S. intelligence officials have pinpointed as one nexus of a foreign propaganda and misinformation campaign before the 2016 elections, the company said it had “found evidence of some connections” between the IRA and whoever was behind this batch. For example, the Resisters account previously had an IRA account as one of its administrators for seven minutes. The Event – “No Unite the Right 2 – DC” – was scheduled to protest an August “Unite the Right” event in Washington. Inauthentic admins of the “Resisters” Page connected with admins from five legitimate Pages to co-host the event. These legitimate Pages unwittingly helped build interest in “No Unite Right 2 – DC” and posted information about transportation, materials, and locations so people could get to the protests. To be clear, the rally is still happening. A replacement event page that no one disputes the legitimacy of has been created. However, organizers are not please that Facebook took the original page down entirely rather than allow them to proceed, given that it had numerous RSVPs and had become a hub for discussion and planning. In other words, DC seemed quite capable of rallying against fascism without the possibly-Russian “Resisters,” with the only tangible effect of their presence being Facebook taking down an event page that had been taken over by other groups. For its part, Facebook said it was taking the event down to prevent people from attending a fake protest and would notify everyone who expressed interest in showing up. However, aside from the DC counter-rally, it should be noted that other accounts discovered during the site’s latest purge of suspected foreign actors mostly had limited followings and were pushing generic left-wing talking points with seemingly little success. It’s clear that Facebook has found itself in a thankless role that it has historically had little appetite for—an arbiter tasked with detecting good-faith and bad-faith usage of its own platform. Of course, having already sucked so much of the internet into its gluttonously profitable for-profit walled garden, it has few good excuses not to get better at it. Perhaps one tiny way they could start is by redirecting anyone who RSVP’d to the original event page to the new one, and sooner rather than later.